Calling loved ones outside France? 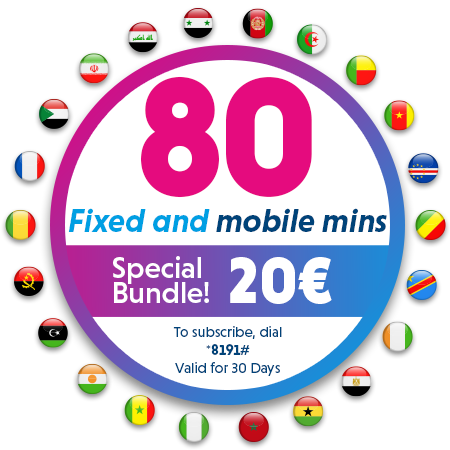 Enjoy more international minutes to loved ones outside France thanks to our bundles. Get one of our exclusive bundles when you top up. This offer is available to customers with a French Vectone Mobile number only. By subscribing to this offer, you accept our general and specific terms and conditions. This Bundle is valid for 30 days, any unused allowance will be cancelled after 30 days even in case of renewal. This offer cannot be combined with Free Credit and any existing Free Credit at the subscription date of this bundle will be lost, however any Free Credit received after the subscription date will be valid. Free promotional credit and credit received via Credit Transfer cannot be used to purchase this bundle. This offer is valid for online and offline purchase. The bundle allowance of this offer cannot be used for roaming. Upon subscription you will be able to use national and international minutes to mobile & landline to France, Afghanistan, Algeria, Benin, Cameroon, Cape Verde, Comoros, Congo, RD Congo, Ivory Coast, Egypt, Ghana, Mali, Morocco, Nigeria, Senegal, Sudan, Iran, Iraq and Syria. Please note that bundles of the same groups cannot be cumulated, if you subscribe to a second special bundle during the 30-day validity period of the first bundle, leftover allowance of the first bundle will be automatically cancelled.